Are you looking for an easy, fun project to make with your kids? Try this quick and simple way to make glowing chalk. Chalk is great summertime fun, but it’s always been a daytime activity. Now, your kids can create their very own glowing chalk in tons of fun colors. Your kids will enjoy making this with you as much as they will enjoy using glowing chalk. The are great for different celebrations. You don’t need to be a mad scientist to make a fun glowing craft as long as you have the right material. In this DIY project, the most ingredient we need is fluorescent or glow-in-the-dark paint. Fluorescent paint requires black light to glow, while glow-in-the-dark paint will do so under black light or in the dark. 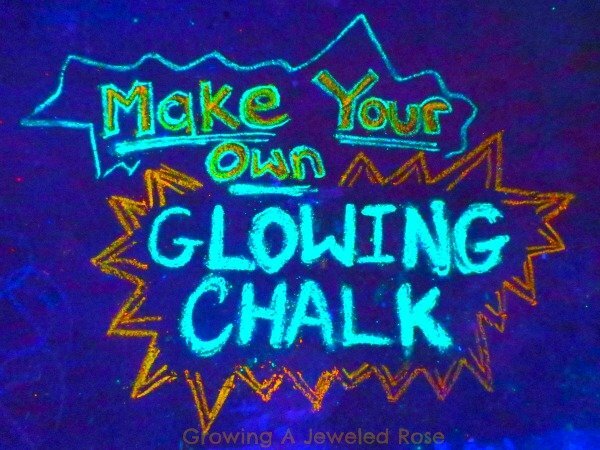 Breathe new life into chalk time with some glow in the dark chalk. No kid can resist the alluring power of the glow. Continuously add plaster of paris to your mixing bowl until you reach a very thick, wet, consistency. Spray some cooking spray on the bottom of an ice cube tray and spoon the mixture into the sections. Make sure to really pack it down! Once dry, pop the trays in the freezer for 10-15 minutes to help the chalk pop out.